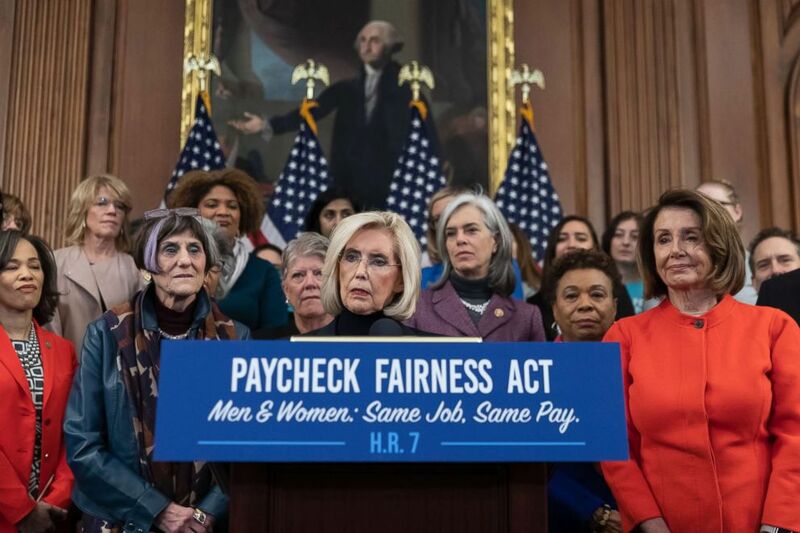 House Democrats reintroduce Paycheck Fairness Act and pledge to vote "soon." Ten years after President Barack Obama signed the Lily Ledbetter Fair Pay Act into law, House Democrats rallied to renew the push towards equal pay for equal work, stressing that while there has been progress towards pay equality, women still earn just 80 cents to the dollar a man makes for the same work. House Speaker Nancy Pelosi says every member of her caucus signed onto an effort reintroducing the Paycheck Fairness Act, and with the partial government shutdown finally over, her new majority is pressing on with its agenda. “It’s really important to know this is part of a fuller agenda of paid sick leave and access to quality, affordable child care to make women in the workplace have the opportunities that we all should,” Pelosi, D-Calif., said. 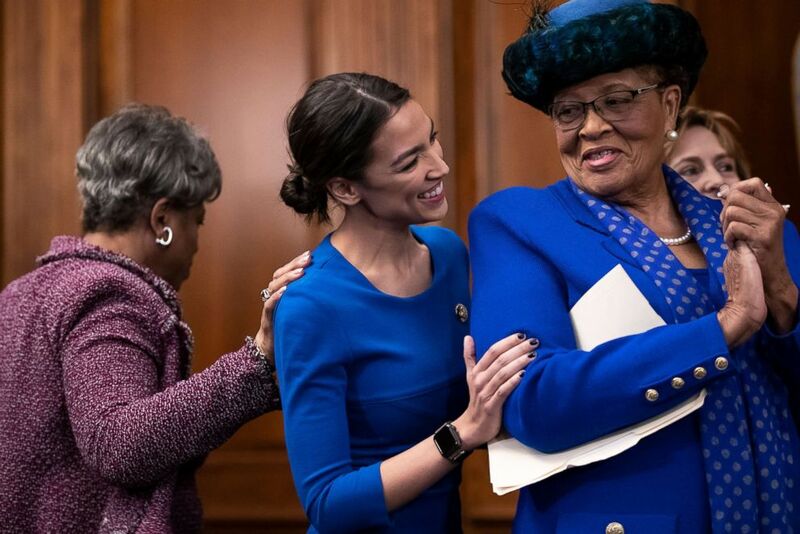 (J. Scott Applewhite/AP) Rep. Brenda Lawrence, left, shows encouragement for Rep. Alexandria Ocasio-Cortez, as she speaks to Rep. Alma Adams at an event to advocate for the Paycheck Fairness Act on the 10th anniversary of President Barack Obama signing the Lilly Ledbetter Fair Pay Act, at the Capitol in Washington, Jan. 30, 2019. Women who work full time in the United States are paid on average 80 percent of what men are paid, according to a 2018 study by the American Association of University Women, an advocacy group that promotes equity and education for women and girls. The analysis also found that disparities are even sharper among Latinas (at 54 percent) and black women (at 63 percent) and range by state from a low of 70 percent in Louisiana and Utah to a high of 89 percent in New York. The political firepower that Democratic women possess heading into the 2020 presidential campaign continues to grow -- with a record number of women expected to seek the Democratic nomination coupled with a record 102 women serving in Congress –- though there is still a majority of white men serving in Congress. A recent ABC News – Washington Post poll found that nearly two-thirds of women say they have already ruled out voting for President Donald Trump in 2020. (J. Scott Applewhite/AP) Lilly Ledbetter, center, an activist for workplace equality, is flanked by Speaker of the House Nancy Pelosi and Rep. Rosa DeLauro while she speaks at an event to advocate for the Paycheck Fairness Act at the Capitol in Washington, Jan. 30, 2019. The bill, designated as H.R. 7, would end so-called pay secrecy, easing workers’ ability to individually or jointly challenge pay discrimination, and strengthening the available remedies for wronged employees, according to the bill’s sponsors. I’m here because equal pay for equal work is an American value. And it’s time that we have American reality. 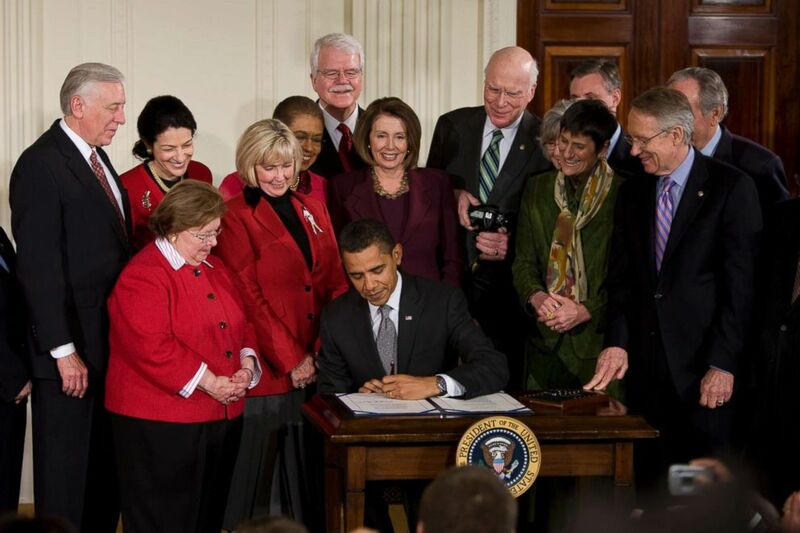 (Brooks Kraft/Corbis via Getty Images, FILE) Surrounded by members of Congress, President Barack Obama signs the Lilly Ledbetter Fair Pay Act while Lilly Ledbetter stands to the left of Obama, Jan. 29, 2009, in the East Room at the White House in Washington. The bill has 240 cosponsors in the House, including every Democrat and one Republican, and there are 45 Democratic cosponsors on companion legislation in the Senate led by Sen. Patty Murray of Washington.